Aerial lifts fall into three main categories – scissor lifts, boom lifts and telehandlers. Although they may seem very similar, each one serves a unique purpose and is best suited for different jobs and environments. 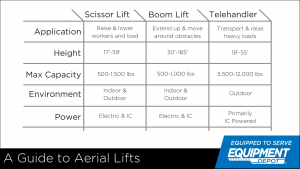 Read this guide to learn everything you need to know about aerial lifts. Scissor lifts are hydraulic platforms that raise and lower heavy loads and workers. The scissor lift design allows the platform to be raised directly above the base. This provides unique stability and distinguishes the scissor lift from other aerial lifts. Scissor lifts serve the same purpose as ladders and scaffolding, but with more reliable reach and carrying capacity. More businesses are investing in scissor lifts to increase productivity and decrease cost. In particular, a scissor lift is ideal for heavy duty loading and unloading or in permanent or semi-permanent installations where workers regularly need to raise and lower heavy equipment and materials. There are three main types of scissor lifts: slab lifts, rough-terrain lifts, and single-man lifts and platforms. Slab scissor lifts are mainly electric-powered equipment, best suited for smooth, paved, flat surfaces, with a load capacity of 500-1,200 lbs., and a reach of 25-46 ft.
Rough-terrain scissor lifts can be electric- or IC-powered. They are equipped with heavy-duty tires and four-wheel drive to maneuver off-road conditions. These have a load capacity of 800-1,500 lbs. and a reach of 32-59 ft.
Single-man scissor lifts and platforms are built for portability. They are designed for a single worker at a time and are often light enough to be pushed. These lifts have a load capacity of 300-500 lbs. and a reach of 17-46 ft.
For any large equipment acquisition, the first step is always evaluating the minimum and maximum requirements of the scissor lift in its planned operations. Once you know this, picking the right lift will be easy. Make sure you consider the following questions before you acquire a scissor lift. What is the intended application of the scissor lift? What is the location of the job site or facility? What platform size will I need? What is the narrowest aisle it will need to pass through? What type of surface will the machine be traversing? What is the required turning radius? Do you have the right power to support the lift if it is electric? What is the maximum load capacity you will need? What is the maximum height you will need to reach? Scissor lifts have two main power source options, they can either be electric powered or they can be powered through internal combustion (IC). It is important to pick the right power source for your application. Electric scissor lifts are generally considered to be the best for indoor use, small-to-medium load capacities, on flat, paved surfaces. Because its intended use is for indoor job sites, an electric scissor lift often has a tighter turning radius and can move around warehouse aisles. However, it has a lower maximum capacity, lower torque, and requires charging periods up to 6-8 hours per 4-hour shift, on average. IC scissor lifts can run on LPG (propane), diesel, or gasoline and are best for outdoor use. While some electric scissor lifts can be used outdoors, there are unique features that make IC scissor lifts exceptionally well-matched with outdoor job sites. An outdoor IC scissor lift is usually a tall lift needed to reach higher electrical or telephone wires. They feature tires with durable tread for rough terrain, larger work platforms, heavier load capacities, and more available torque. Outdoor IC lifts are not restricted by battery runtime and can run around the clock. Electric lifts are usually cheaper to operate than IC lifts overall but may cost more initially. IC lifts, if used indoors, will require a work site with ample ventilation because of fuel emissions. Electric lifts have zero emissions and are safer for the environment. 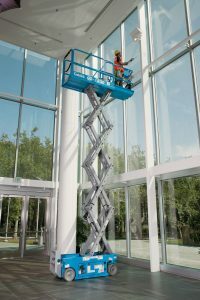 The choice between electric and IC, however, should depend more on the scissor lift’s intended use than on anything else. Table, pallet, dock, and tote lifts also use the scissor mechanism to raise pallets and other heavyweight objects in a warehouse setting. They address an assortment of needs and are often constructed to be very portable and mobile. Dock lifts, for example, can move heavy loads from a warehouse floor to the height of a freighter or tractor-trailer bed. Conventional scissor lifts can be customized with a variety of add-on packages for applications including plumbing, electrical, cutting, and welding. Platform extensions can give operators extra space for an additional worker or tools and equipment. The extension also lets operators move over obstacles. For example, an operator can use the extension to work on a lighting fixture over a railing. Boom lifts are another type of aerial work platforms and are known by many other names including cherry picker, man lift and basket crane. 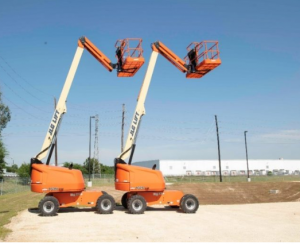 Boom lifts are very similar to scissor lifts; however, they can typically reach higher heights and are equipped to maneuver around obstacles. Unlike most telehandlers, boom lifts are used to transport personnel and materials to high heights. A basic boom lift consists of a grounded base, a hydraulic lift system powering a crane and a platform or bucket. Boom Lifts are sometimes attached to a truck or van, making them very easy to transport. Boom lifts can extend anywhere from 30 to 170 feet and can either be electrically powered or powered by IC engines. They are especially useful for accessing hard to reach areas that could be potentially dangerous. Booms are often used by firefighters, construction, electricians and sometimes even window cleaners. 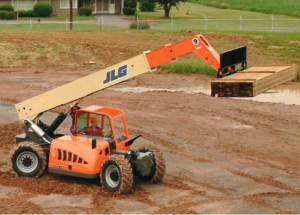 There are two main types of boom lifts that you can use. Straight booms, often called telescopic boom lifts, have a work platform that is attached to a telescopic extension arm. The arm does not have hinges, so it is limited in its ability to maneuver obstacles, however, it can reach the highest height of all the aerial lifts and is very stable. A hydraulically powered arm moves the bucket up and down. These can reach heights anywhere between 40 and 185 ft. and can carry anywhere between 500 – 1,000 pounds depending on the machine. Articulating booms have multiple boom sections that articulate or “hinge.” This means that the articulating boom is able to bend the extension arm to get around obstacles. Although it cannot reach as high as a telescopic boom, it is perfect for hard-to-reach areas. Because of its design, the articulating boom is able to fold up more compactly when the machine is not in use. Articulating booms can be used indoors or outdoors. They can reach heights anywhere between 30 and 140 ft. and tend to have a load capacity between 500 and 1,000 lbs. Make sure you know the answer to these questions before you rent or buy a boom lift. What is the maximum height you will need to reach with the boom lift? Are there any obstacles you need to maneuver around? What is the maximum combined height of personnel, equipment and materials you will need to raise with my boom lift? Will you be operating the boom lift indoors or outdoors? Will you need to move my boom lift through any tight doorframes? If so, what is the width of that door frame? What size work platform do you need? Because telescopic boom lifts are designed to reach so high, they are not intended for internal use. Because of this, telescopic boom lifts are powered by internal combustion engines. Articulating boom lifts can be powered by either internal combustion engines or electric engines. If you are operating indoors, you should use an electric articulating boom. This will prevent any harmful fumes from being trapped in an enclosed space. A telescopic handler, also known as a telehandler, is a rough terrain variable reach forklift. It is similar to a telescopic boom but is fitted with a lifting attachment. Telehandlers operate like a forklift, but at greater heights, and are most commonly used in the agricultural and construction industries. Most telehandlers come with a 4-wheel drive chassis equipped with a telescopic boom that provides lift heights of 50 feet or more. The telescopic boom moves the load forwards and upwards. Often times, telehandlers are compared to cranes because they both elevate loads. However, telehandlers are better at picking up loads from harder to reach cargo areas such as the inside of a trailer. Telehandlers are often more practical and efficient than cranes, because the ability to reach out in front of the telehandler gives the operator more flexibility in the placement of the load. There are two main types of telehandlers. This is the standard telehandler, with an arm that goes up and down and in and out. These telehandlers can reach anywhere from 18 to 55 feet and have rated load capacities anywhere from 5,500 to 12,000 lbs. Similar to a standard telehandler, the rotating telehandler has the capacity to move the arm in the same motions. However, the rotating telehandler takes it a step further and enables the arm to swivel 360 degrees, allowing the telehandler to service a wide are from a single position. There are a few things you should consider to find out which telehandler is best for your operation. What is the maximum load capacity you will be moving? What is the maximum height you will have to reach? What is the maximum distance your front tires will be from the loading zone? Is it necessary to be able to swivel the arm? Will you need any special attachments? This will allow you to figure out the size of the telehandler you will need. The capacity of your telehandler at different load weights and angles should be listed on your telehandler. Never exceed the rated capacity. Because telehandlers are designed to be rough terrain vehicles, they are most frequently powered by internal combustion engines. However, if you need to operate your telehandler inside, there are some options that will allow you to do so safely. It is important to note that if you use your internal combustion engine telehandler inside, you are risking serious injury from fumes from the engine. Always consult with your sales representative or the operating manual before operating a telehandler indoors. Telehandlers can sometimes have specialty attachments besides the forks. Some of the most common attachments are buckets or bucket grabs, especially in the agriculture industry. Before you rent or buy a telehandler, make sure your material handling partner has all of the required parts and attachments you will need to operate your equipment. Which Aerial Lift is Right for Me? With so many aerial lift options available, it can be hard to tell which one is right for your job. Check out this handy graph to figure out which one is right for you! If you need more information about purchasing or renting an aerial lift, our knowledgeable and dedicated team is ready to help you find the right equipment for the job! Call 888.EQDEPOT or contact your local sales representative today to get your free quote!